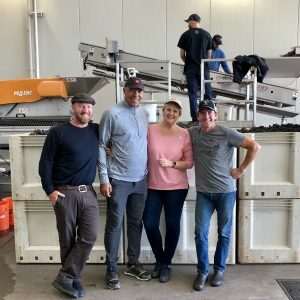 It hardly seems possible, but we just completed our 10th harvest at Jungle Love Vineyard. We still feel like beginners, learning more each year about farming and winemaking. After a decade in Napa Valley, we’re reflecting on what the development and launch of our own micro-boutique wine label has meant to us, and where we want to take Okapi next. Making 100% estate grown Cabs means that we don’t blend with grapes from other vineyards to create a consistent flavor profile or hit targeted numbers in some lab. Instead, our winemaker Ted Osborne works closely with vineyard manager Mike Nuñez to pick the grapes at the peak moment of their ripeness, then handles them gently to coax out the very best qualities of each year’s harvest. As a result, each vintage is different, but Cabernet lovers can detect the common thread tying them all to our exuberant 1.7-acre patch of dirt. The wonderful crew of men and women who hand pick our grapes can clear the vineyard in about three hours. Working in the middle of the night, they wear miner’s lamps on their heads and may even tape a blade to their glove so they can work faster. They cut and drop the best grape clusters into a small bin at their feet, kicking that bin down the row as they go. When it is full, they carry it to larger bins that will eventually hold half a ton of grapes each. They work fast, but they pick “clean,” meaning they don’t take underdeveloped clusters, or mix in sticks and leaves as they go. Our favorite harvest was the year hot air balloons dipped low enough to graze the top of the vineyard palm tree, taking aerial photos of the workers as the sun came up. Everyone was cheering and waving, and we couldn’t have been happier to share the experience with these enthusiastic gawkers. If only we had those pictures! Each year brings some drama: Will we get last minute rain that could dilute the fruit or – worse – allow mold to develop on the skins? Will our crew be able to get here on the night we decide the grapes are ready? Will the birds discover the grapes’ deliciousness before we can chase them away banging pots and pans? Have we accurately predicted the yield and ordered enough barrels from France? With experience comes the understanding that it is more art than science, and more good luck than anything else. Good luck in finding talented people to help us. Good luck in planting the right rootstocks and grape vines. Good luck with the weather. Good luck in avoiding the devastation of the smoke and fires. Every time we open a bottle of Okapi, we do so with gratitude, because we know we have been lucky, and we know we will be happy with the wine.